Pete Mockaitis is an award-winning trainer and coach who helps professionals perform optimally at work. His work has been featured in the New York Times, Forbes, and Ink. He’s delivered one-on-one coaching to over 700 leaders hailing from organizations all over the world – fifty countries, to be exact. Some of these organizations include Google, FedEx, Amazon, Apple, Anheuser-Busch, and The United Nations. 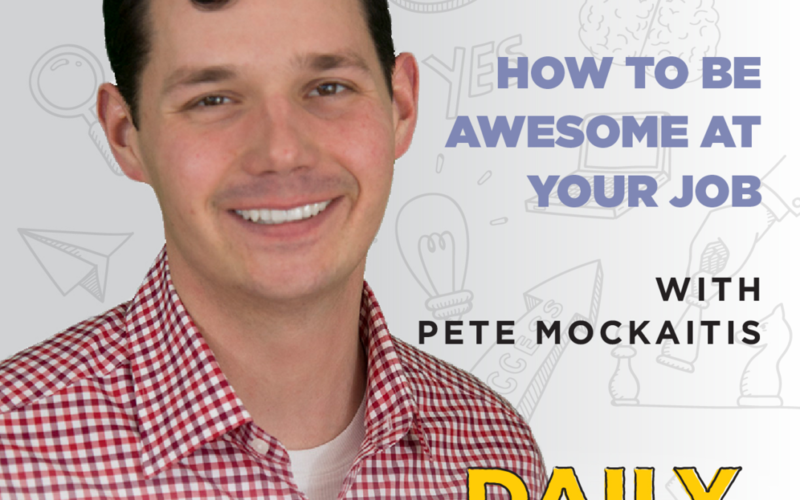 Pete began his career at Bain & Company, and currently hosts the How To Be Awesome At Your Job podcast. His show has been downloaded over three million times, and consistently ranks as a top business show on iTunes. Pete lives with his wife and baby boy in Chicago, Illinois – but today, we’re lucky enough to have him with us. – Get some video of you communicating (either in a formal presentation, or just participating in a meeting). You’ll probably be shocked at some of the things that you see. – Make sure you’re involving some vocal variety in your speaking voice (pitch, pace, and volume). – Check out your Amazon order history. Each item represents a decision that you’ve made. Reflect on them. Which do you still feel good about? Which were a mistake? – Get enough sleep! It’s truly a game-changer.